Back in March, I took a trip to UAE to visit Dubai and Abu Dhabi. I’ll be honest – the trip itself was solely inspired by my need to redeem my American Airlines miles for something extraordinary before the March 2016 devaluation. 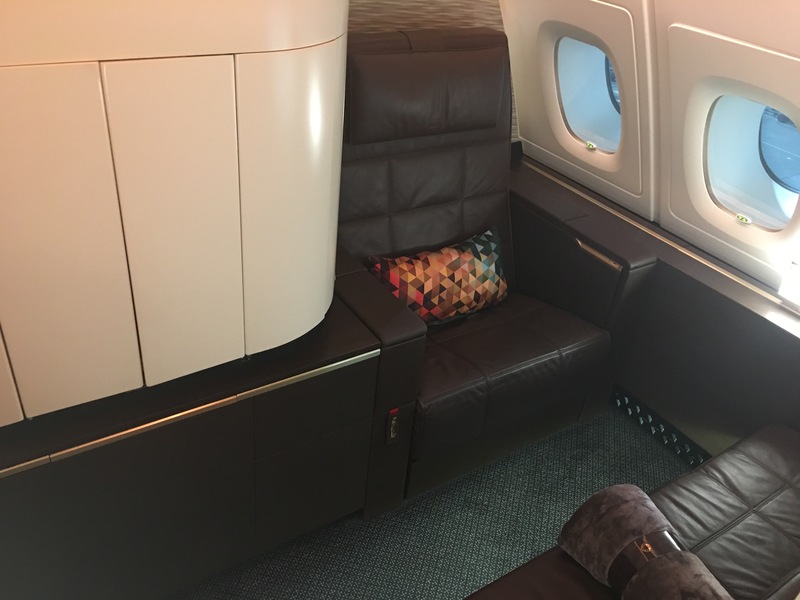 When 2 seats on Etihad’s A380 first class apartments opened up, I did not hesitate to snag them. I also made it a point to *really* enjoy myself in Dubai. Without a doubt, Etihad’s Airbus A380 just might be the most extraordinary plane in the sky. 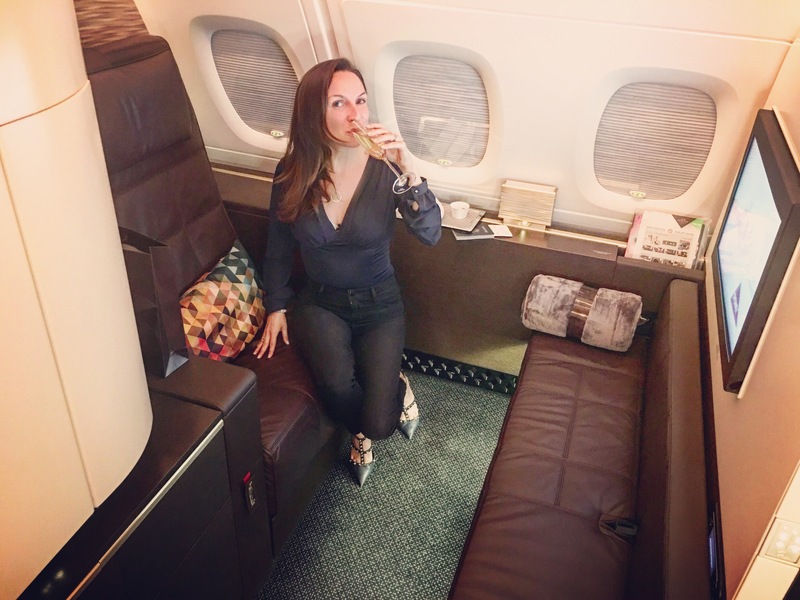 I’ve flown on Singapore Airlines’ A380 in their first class suites, so I was excited to see how the two products compared; I was very impressed with my Etihad A380 business class experience from New York to Abu Dhabi, so the bar was already set pretty high. As I mentioned in my previous post, I redeemed 90,000 American Airlines miles for this award. I’ll also note that I did receive 10% back on redeemed miles just by having a co-branded American Airlines credit card. The total price for my award was 81,000 miles + ~$21 in taxes. I like to say that I had the best seat in the house, 3K. Besides having a window “apartment”, I was also able to share space with my husband, as he was in 4K. It’s absolutely worth mentioning that apartments in rows 3 and 4 are great if you’re traveling with a companion since they connected by a divider that slides down by the bed (almost mimicking a double bed so you can sleep besides each other). The only downside of 3K was that it is rear-facing. I’ll also point out that the seats on the right side of the plane are upholstered in dark brown leather, while the apartments on the left are tan, in case you may have a design preference. Dark brown goes well with champagne. Etihad business and first class passengers get round-trip airport transfers, even on award tickets. What’s also super neat is that Etihad will set up your pickup from anywhere in the UAE (in the US, it’s up to 60-70 miles driven distance to and from the airport). 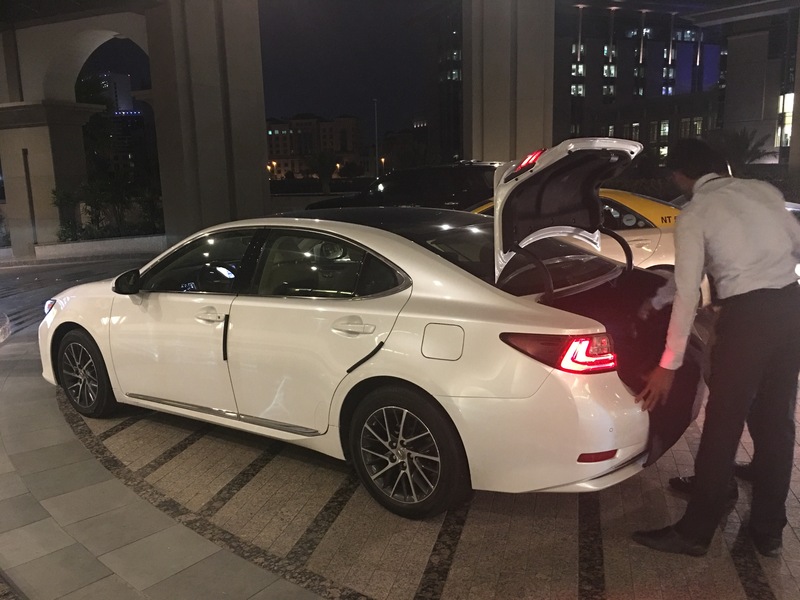 We set submitted our chauffeur request online to be picked up from our Hyatt Regency in Dubai (over an hour away from AUH). Our flight departed a little after 3 am, but we wanted to hang out and see all that the lounge had to offer, so we requested a 10 pm pickup. Unlike our ride to JFK, all 3 of us were unable to be booked in one SUV car, so they sent 2 luxury sedans (which we thought was wasteful; however, they wouldn’t let all 3 of us ride in the same car). Our drivers showed up on time, and the ride was smooth. Though the transfer was included in our tickets, we felt it was appropriate to tip our driver the equivalence of $20 at the end of the ride. 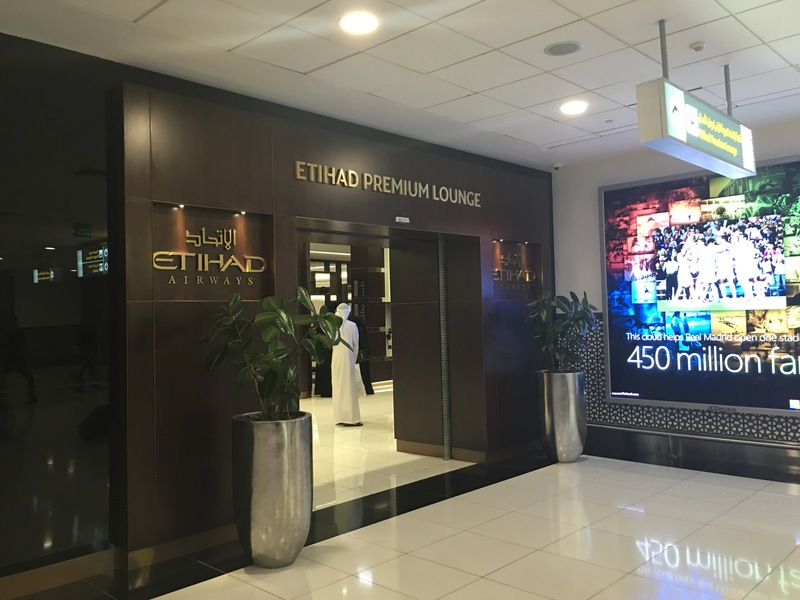 The Etihad Premium Lounge AUH is located directly after the first security checkpoint and is accessible to first and business class passengers (also note that first class passengers can not guest another passenger in). Unlike the brand new [and exceptional] new Etihad first class lounge at JFK that offers ala carte dining, this lounge does not. 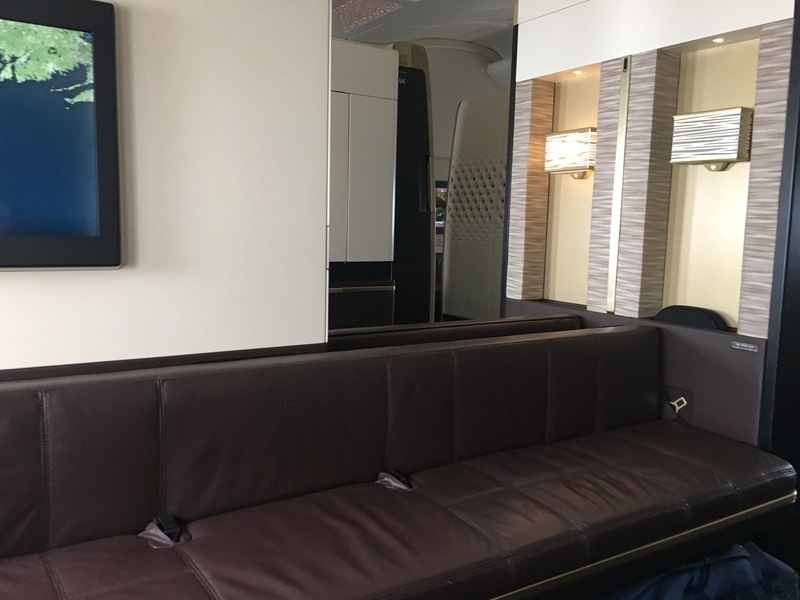 In fact, there’s really no distinguished “first class” section of the lounge other than a separate seating area that is monitored by an attendant checking boarding passes. 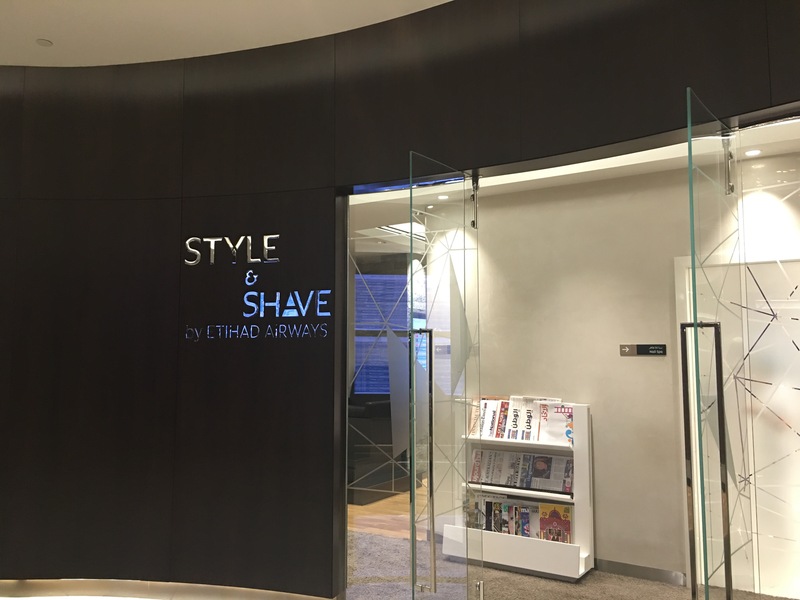 However the Etihad lounge does offer some unique amenities for passengers traveling in first class such a complimentary 15-minute spa treatment (massage, manicure, or mini facial) and a shave or a hair cut for men, and blowout or eyebrow shaping for women. I went with the blowout and massage. 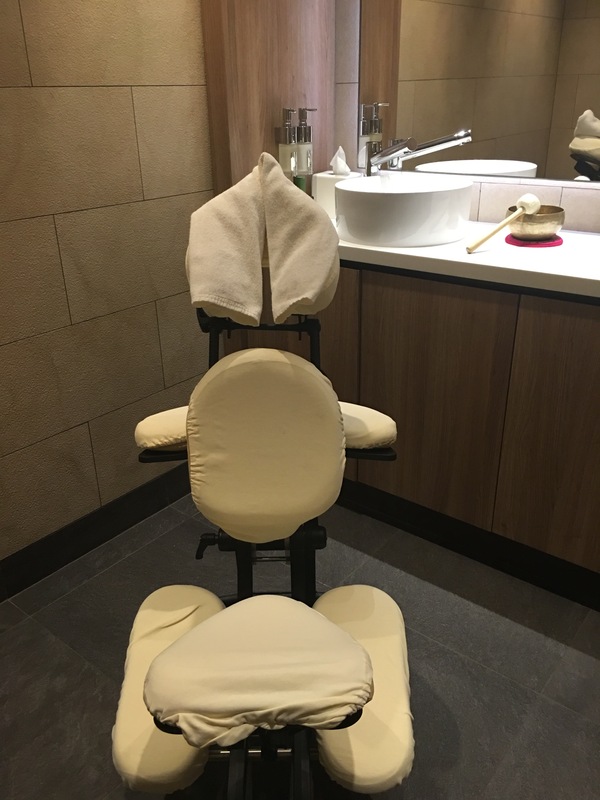 The massage was absolutely amazing, and for 15-minutes, I really did feel like I escaped into a spa in my private room with dimmed lighting, aromatherapy & the works. The massage was on point! The blowout was… interesting. 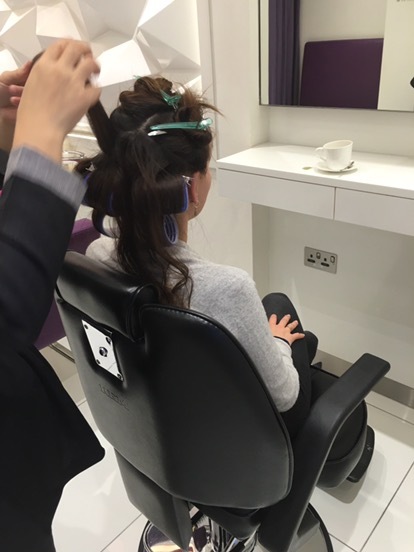 Aside from her putting way too much product in my hair (we’re talking 1/2 a bottle of mousse), at one point I had 3 people blow drying my hair simultaneously. At the end of the day, I guess the goal was accomplished because my hair was dry, but all I’ll say is don’t expect “drybar” results. As far as the food at the lounge, it was strictly buffet style and nothing to write home about. I had high standards about this lounge because of how great the food was in the JFK. I was a bit underwhelmed, but then I learned that they’re in the process of building a brand new Etihad lounge at AUH that’s set to open really soon. If it’s anything like the lounge at JFK, I’ll be over the moon. For those familiar with lounges, I would say the Etihad Premium lounge is in the same ballpark as the British Airways Lounge at JFK. 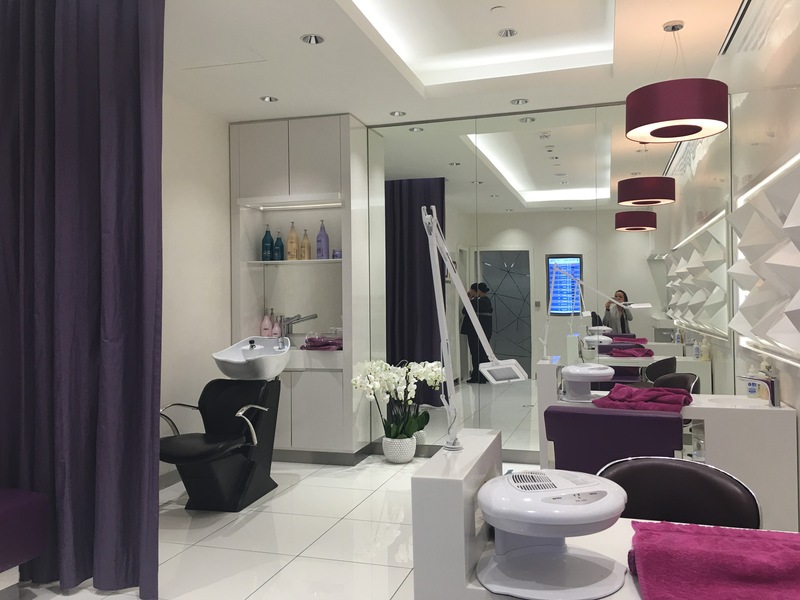 Another thing to note is that you have to clear US customs before leaving Abu Dhabi, so factor the time it takes to do that into your lounge time. I have Global Entry, so it took me no more than 15 minutes, but the general line looked ridiculously painful. Once through customs, there’s another Etihad lounge to hang out in that’s much smaller before the gate. My first impressions of the Etihad apartments was quite a favorable one. It is arguably the best first class product I’ve flown in terms of size and hard product. 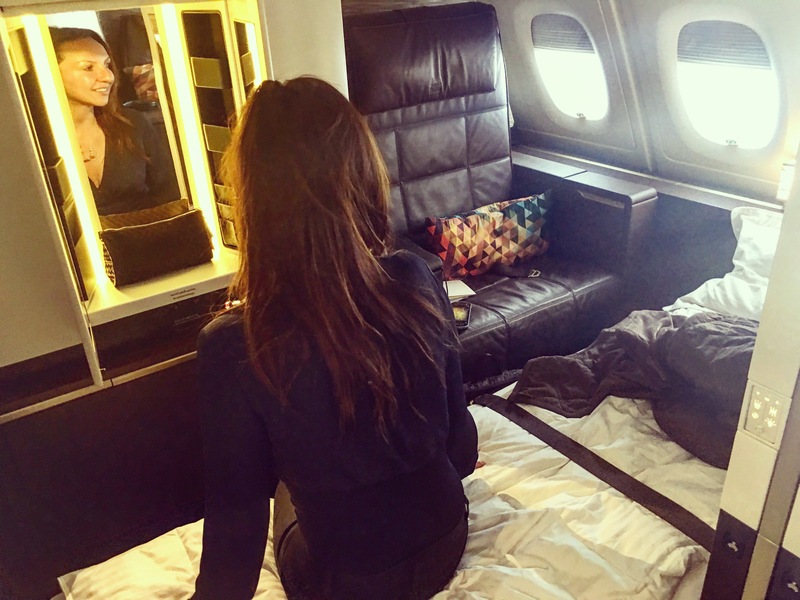 I especially loved that the seat was separate than the bed, and I loved the privacy of the suite. It was also nice to be connected to my husband’s “apartment” when the divider was down. Our space combined was huge and we could easily fit 4-5 people if we wanted to. View from my seat, separate bed area, and looking into apartment 4K. I went right to bed as soon as we took off! My amenity kit was located inside of the vanity. The vanity was an innovative offering, but I am not sure if it’s a practical use of space unless you plan on putting a full-face of makeup on. There were two versions of the amenity kit – one for “her” and one for “him”. The female amenity kit was cute, nice quality, and beautifully designed with a suede tassel as a finishing touch. The male bag was structured with a similar design. Inside, it was lacking compared to others I’ve received. 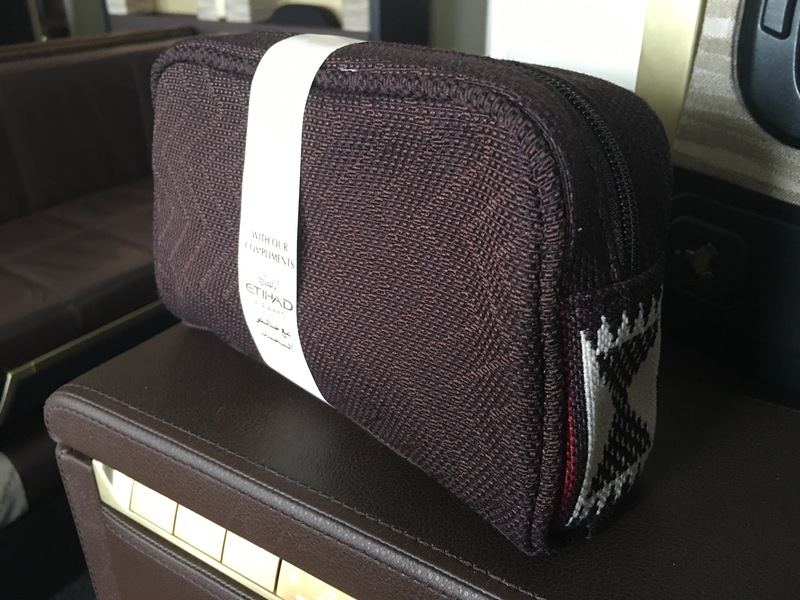 In comparison, Singapore Airlines’ amenity kit contains a full-size Salvatore Ferragamo fragrance. I also loved Lufthansa’s hard-shell Rimowa kits. 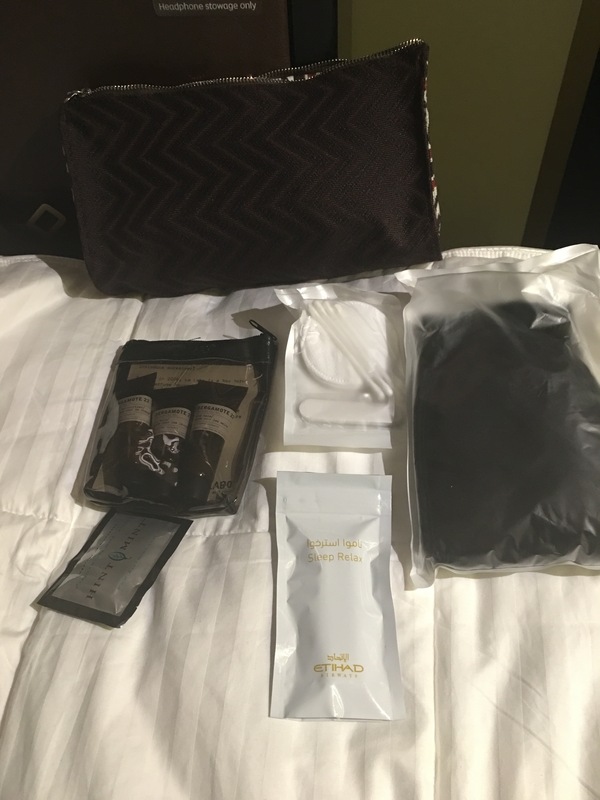 The Etihad first class amenity kit was pretty standard – ear plugs, socks, mints, and hand cream, lipgloss, and facial moisturizer from Bergamote. The pajamas were great – super comfortable and high quality. I was too focused on taking a shower that I forgot to take my usual pajama selfie in the lav. The food on board was plentiful, and you have the option to dine solo or with a companion. There’s an extensive wine list and multi-course dinner selection. You also have the option to order “anytime” snacks and small plates (cheese platters, steak sandwiches, baklava, etc.) Since the flight departed at 3:25 am, I immediately fell asleep (and for 7 hours!). I opted to have my meal immediately after I woke up. 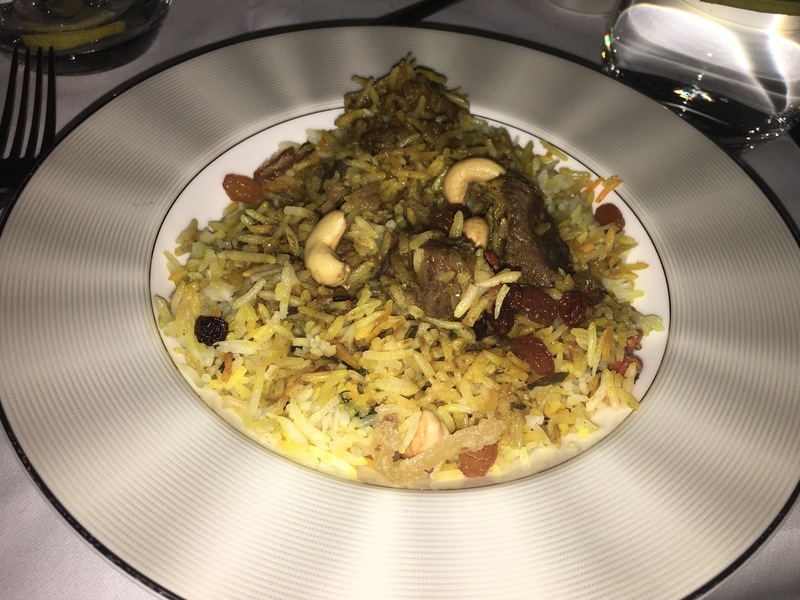 For my dinner I chose the scallops for an appetizer and the lamb biryani for my main course. 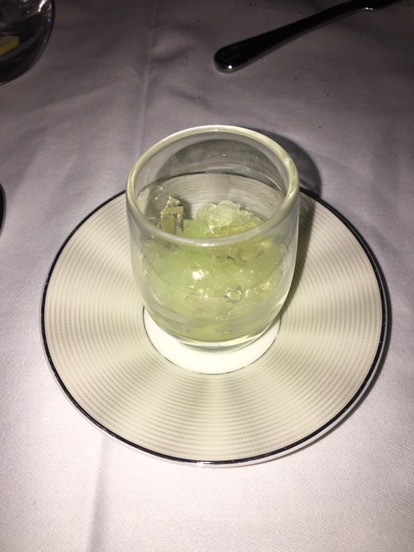 Before the scallops arrived, we were presented with a taster dish (I honestly cannot recall what it was, but it was good). 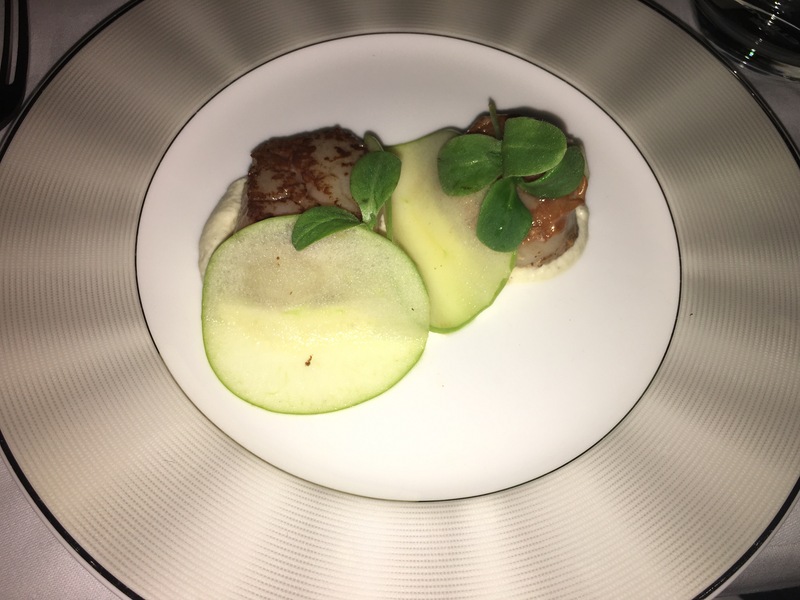 The scallops tasted great, but the lamb seemed a bit overcooked. I hope I’m not sounding like a food snob. 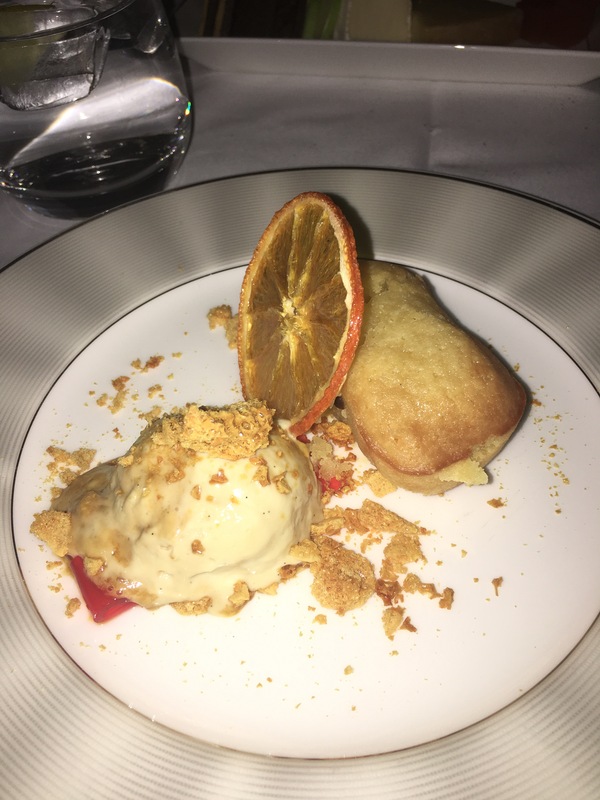 For dessert I went with the citrus frangipane. The honeycomb ice-cream was good, but the rest of the dessert was just ok. The shower is timed to 7 minutes of water per passenger. The water pressure was extraordinary, and the water was hot. I pretty much showered just to be able to say I did, but one could easily have a great shower complete with fancy Bergamote products on board. After my shower and a bit more of hanging out, it was already time for breakfast. I went with the egg omelet and fruit. As you can see, the eggs were so overdone that they were pretty much rubbery. 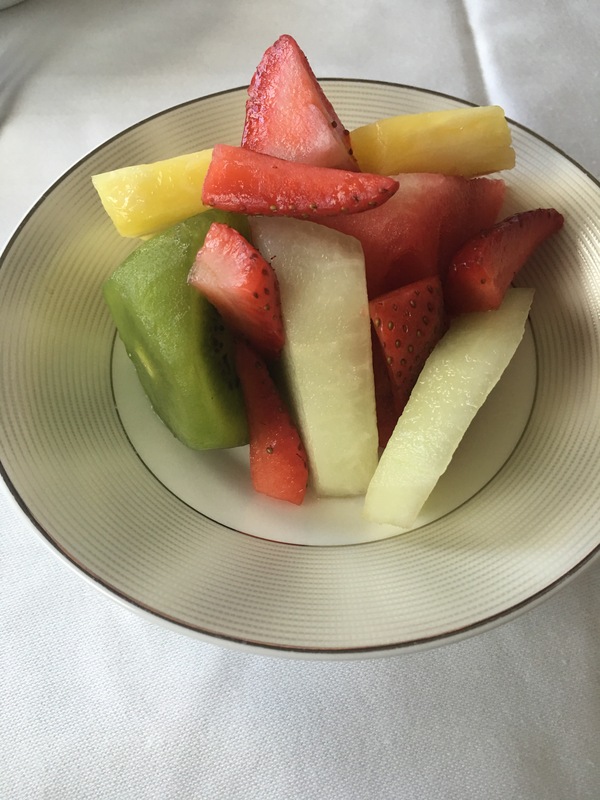 The fruit was not that fresh either. Luckily I was still full from dinner that I wasn’t relying on breakfast to fulfill me. Before we knew it, 14 hours flew by and we were on the ground at JFK. I felt refreshed after an amazing and comfortable in-flight experience with plenty of sleep in a “real bed”. Our black SUV transfer was waiting for us when we deplaned and it was nice that getting back home was a seamless process. 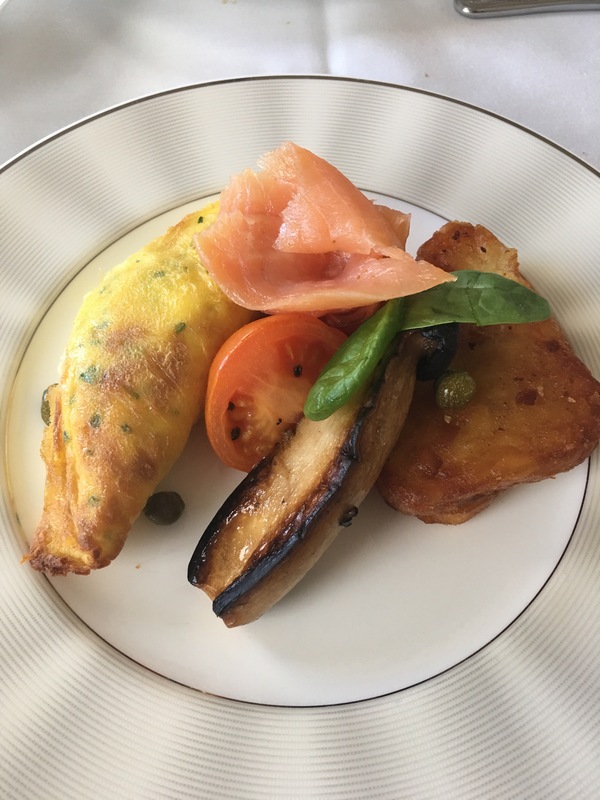 Overall, I really loved my Etihad experience from start to finish. 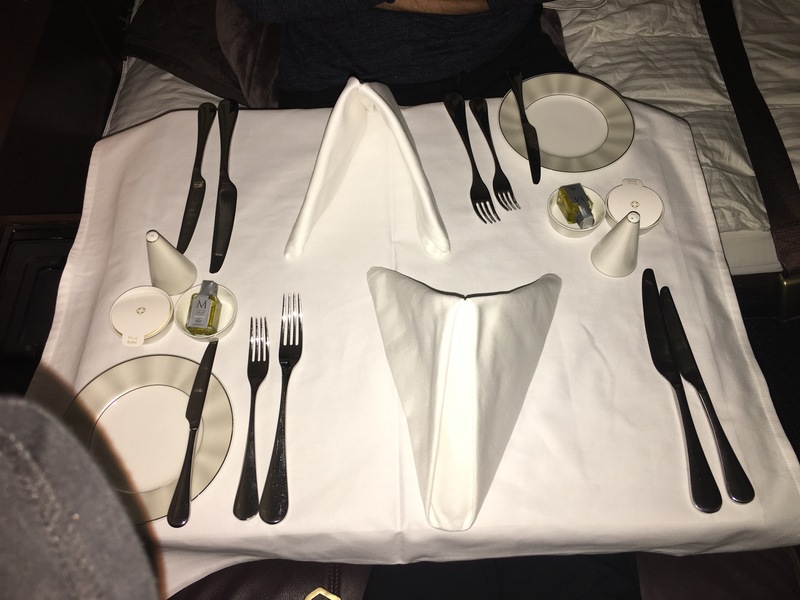 It was hands-down the best first class experience I’ve had in terms of seat/hard product. I also really appreciated all of the “extras” – the chauffeurs, massage in lounge, the shower in the sky etc. 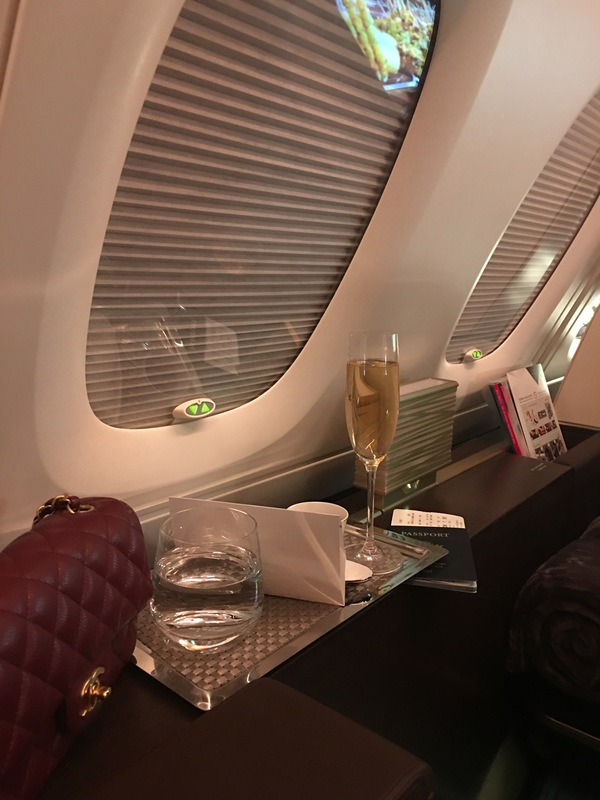 For 90,000 American Airlines miles, it was truly a great redemption for a 14 hour flight, and I wouldn’t hesitate to fly with Etihad again. 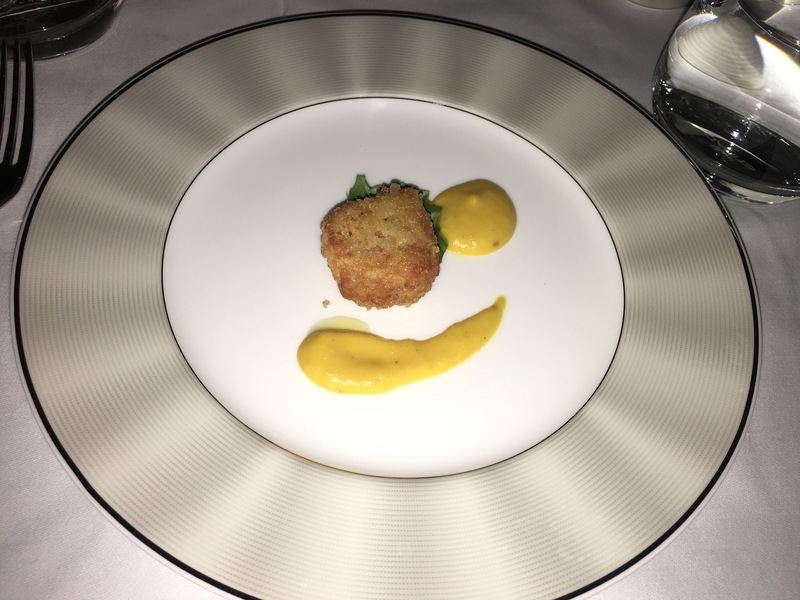 The service was impeccable from all of the crew, but the only drawback was that the food was underwhelming. Hopefully they can make a few minor improvements in that department, and I hope the new first class lounge at AUH ends up being exceptional. Have you flown in the Etihad First Class apartments yet? If so, how did you experience compare? Great review Angelina. You are a good writer and you gave a great overview for the flight. It is awesome you found two seats! I couldn’t find any date that worked with my schedule prior to the devaluation so hats off to you. Your suggestion about the minibar was good. It’s too bad it was filled with things you didn’t like. I guess having the onboard bar a few steps away though made up for it though. Did you dine in your apartment or in the bar area? Great review! Quick question what did you find the best/cheapest way to convert dollars to dirhams? I have a ATM card from a community bank that doesn’t have forex fees. Thinking this will probably be the cheapest way. While I can’t speak specifically to the UAE, in all other circumstances I’ve found that to be true. All over Europe and Asia, I’ve done it both ways. If you look at the cost of purchasing currency at home it’s ridiculous. I have a Schwab brokerage checking account that refunds all fees also–it’s definitely the best way to do it. Just make sure your card has a chip–some ATMs in the Netherlands and Germany only accept the card half way (just enough to read the chip), so that might be the case elsewhere. Exactly! Thanks for taking the time to reply to this question. I always recommend taking out the currency at the ATM instead of back home before the trip. Great Review. I am scheduled to fly same AUH-JFK route in F with family after a month. Can’t wait to experience it! We have etihad car service booked for JFK-EWR transfer. Some folks said they don’t offer airport to airport transfer. 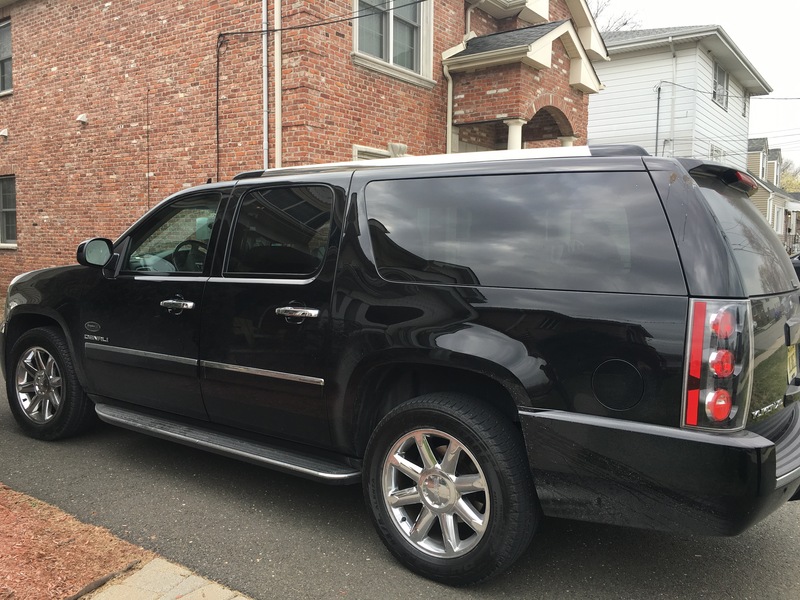 Any experience with using their car service for JFK-EWR airport transfer service? Just want to make sure if they don’t do it, I can make other arrangements.